In recent years there have been major developments in spectacle lenses technology, all designed to improve your vision and to make your spectacles more comfortable to wear and to look more attractive. We at InView Opticians, work with independent laboratories as well as larger lenses companies to offer a large range of lenses to suit your needs. We are not tied to any particular supplier so we can discuss your options fully. At InView Opticians we are happy to discuss and advise the most suitable lenses required for your life style and individual visual requirements. There being so many lenses combinations now available, we feel that our expert advice can help you make the correct choice for your needs. 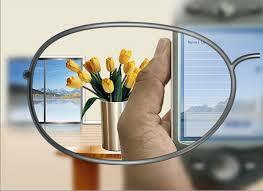 Varifocal Lenses - (the modern alternative to bifocal lenses without the line). They are normally advised to people over the age of 40, normally when separate distance and near prescriptions are required giving you clear vision at all distances. High Index Lenses - In the past, some patients who have had a more complex prescription have had to put up with thicker and heavier lenses in their spectacles. Thankfully today's advances means the super thin and light weight Hi-index lenses now make them look great and feel more comfortable. Transitions - They are fast acting variable tinted lenses which darken in sunlight. Indoors they are clear, but outside they rapidly darken effectively changing them into conventional sunglasses. Transitions are available in grey or brown tints and offer 100% protection against damaging UV light. Lenses Coatings - They are advised to reduce annoying reflections, improve the appearance of your spectacles and most importantly to enhance you vision. More recent advances in technology now means you can get the added benefit of them being resistant to scratches, anti-dust, repellent to water, grease and dirt making them more durable and a lot easier to clean. For any further information on any lenses type, please do not hesitate to contact us.